KEEP COOL WITH NO EFFORT! Install the Ice House Roof® beneath roof decking and reduce heat in the attic—no fans or electricity needed. This flexible radiant barrier uses continuous soffit and ridge venting to carry heat away by natural convection. 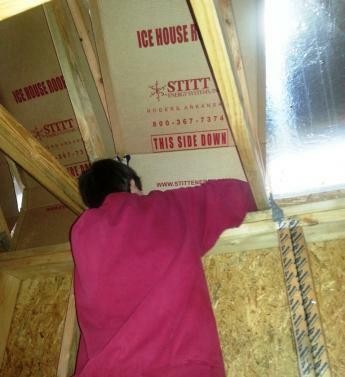 Ice House Roof® panels fit between 24" on-center roof rafters. They're lightweight and easy to install in both new and existing homes. Begin installing panels near the eaves. Work your way up, stapling the side flaps to the trusses to create a 2" air channel between the roof decking and the panel. Successive panels overlap the ones below them by 2". When you reach the ridge, bend the panel and continue stapling a few inches down the other side. Do the same for the panels from the opposite side of the roof. 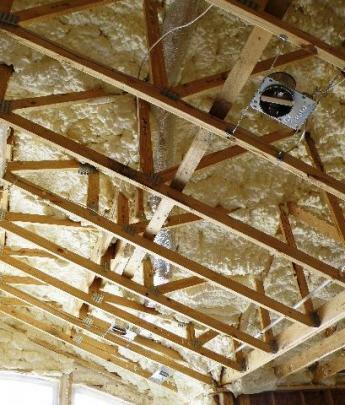 We recommend applying spray foam insulation to the under side of the Ice House Roof® to air seal and insulate the attic. This moderates the temperature and improves the efficiency of any heating and air conditioning ductwork in the attic. BONUS! The insulated Ice House Roof® maintains a consistent roof temperature from the eaves to the ridge to minimize ice dams in cold climates. Call or email us to include the Ice House Roof in your home or project!